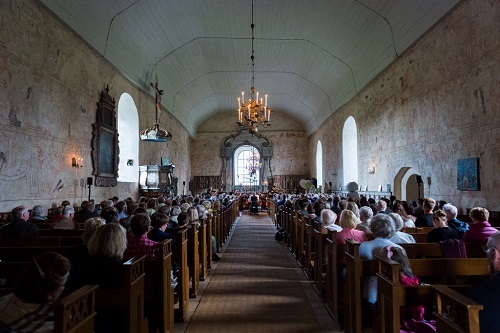 The Church opera Pictures of Life will have it´s first performance during Korsholm Music Festival 2019. Composer Olli Kortekangas and Pia Perkiö, writer of the libretto, have got the inspiration to the work from the paintings on the walls in Isokyrö medieval Church from 1304, where also the opera gets it´s worldpremiere 1.8. 2019. The piece is written for Seinäjoki and Vaasa City Orchestras, Vaasa Opera Choir and children´s choir and two soloists. The soloists will be soprano Päivi Nisula and baritone Waltteri Torikka. Conductor for the music Anna-Maria Helsing, Scene director Ville Saukkonen. The church is numbered according to rows, and the prices are according to the row position.